THE JOYFUL VOICE is a spontaneous, in-the-moment, FUN way to LIBERATE YOUR VOICE…and your creativity, as well. Using a series of (occasionally nutty) exercises, you'll be given the framework and the permission to let your voice out of its cage! PREREQUISITE: None! This is not about learning to be a "singer" or about having a "good voice." This is about the soul's yearning to sing with others. 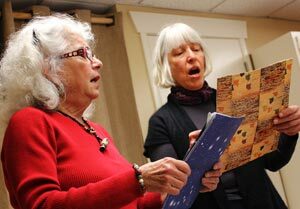 I have facilitated these kinds of vocal workshops, in addition to or as part of my drumming workshops, for over 20 years. I don't like to memorize, so workshops based on spontaneity and improvisation free me from the nerve-wracking fear of having to remember things – or get things "right." I has studied vocal improvisation with many fine teachers including Rhiannon and Christian Swenson. Call me old-fashioned, but I think making music should be FUN and accessible to everyone! 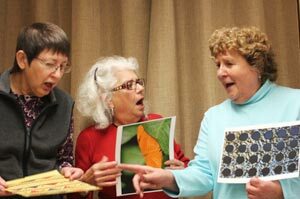 Are you in a singing group? I can help you expand your creativity through the art of vocal improvisation.